Being an island, Siesta Key is a popular place for boaters. There are several marinas on Siesta Key and a public boat launch at Turtle Beach. Many boaters choose Siesta Key for their home because of the easy access to the Gulf of Mexico for their power boat or sailboat. 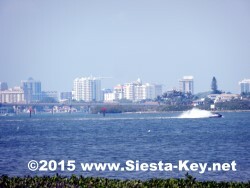 The many canals and protected bays along the Intracoastal Waterway make Siesta Key a boating paradise. Here are charts showing slow speed zones in Sarasota County.